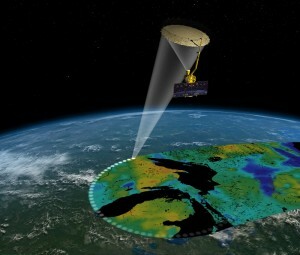 Artist’s rendering of the Soil Moisture Active Passive satellite. On the 31st January NASA launched their Soil Moisture Active Passive satellite, generally known by the more pronounceable acronym SMAP, aboard the Delta 2 rocket. It will go into a near polar sun-synchronous orbit at an altitude of 685km. The SMAP mission will measure the amount of water in the top five centimetres of soil, and whether the ground is frozen or not. These two measurements will be combined to produce global maps of soil moisture to improve understanding of the water, carbon and energy cycles. This data will support applications ranging from weather forecasting, monitoring droughts, flood prediction and crop productivity, as well as providing valuable information to climate science. The satellite carries two instruments; a passive L-Band radiometer and an active L-Band synthetic aperture radar (SAR). Once in space the satellite will deploy a spinning 6m gold-coated mesh antenna which will measure the backscatter of radar pulses, and the naturally occurring microwave emissions, from off the Earth’s surface. Rotating 14.6 times every minute, the antenna will provide overlapping loops of 1000km giving a wide measurement swath. This means that whilst the satellite itself only has an eight day repeat cycle, SMAP will take global measurements every two to three days. Interestingly, although antennas have previously been used in large communication satellites, this will be the first time a deployable antenna, and the first time a spinning application, have been used for scientific measurement. The radiometer has a high soil moisture measurement accuracy, but has a spatial resolution of only 40km; whereas the SAR instrument has much higher spatial resolution of 10km, but with lower soil moisture measurement sensitivity. Combining the passive and active observations will give measurements of soil moisture at 10km, and freeze/thaw ground state at 3km. Whilst SMAP is focussed on provided on mapping Earth’s non-water surface, it’s also anticipated to provide valuable data on ocean salinity. SMAP will provide data about soil moisture content across the world, the variability of which is not currently well understood. However, it’s vital to understanding both the water and carbon cycles that impact our weather and climate. This entry was posted in Data, Earth Observation, NASA, Remote Sensing, Research, Space Can Help, Space Industry, Understanding Space and tagged antenna, Earth Observation, NASA, ocean salinity, radar, radiometer, remote sensing, SAR, SMAP, soil moisture active passive satellite, spatial resolution by Andy. Bookmark the permalink.